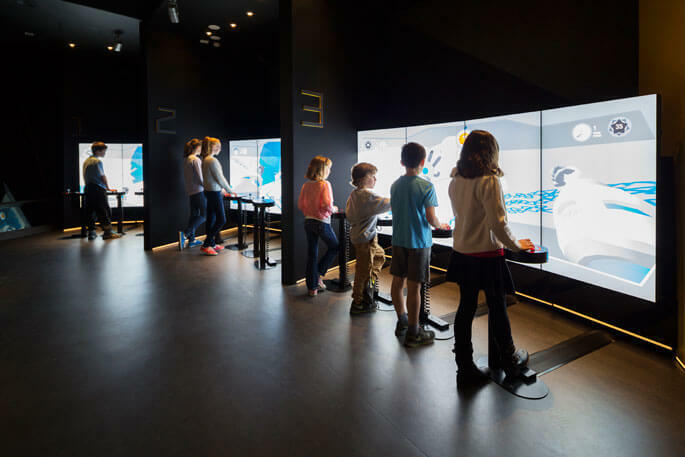 Kspace is the National Museum’s interactive adventure game for kids. Designed for children aged 5 to 12, it’s fun for children and adults alike. 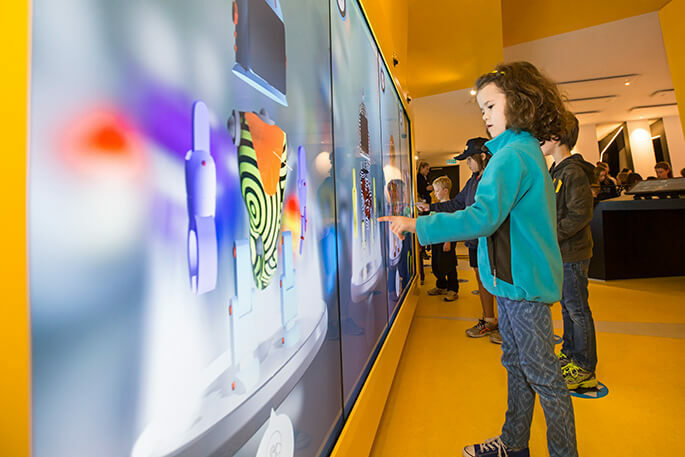 The experience encourages children to learn about Australian's history using a fun interactive game. The whole experience takes 30 minutes to complete. Design Station - Create your own personalised robot to control in the game. Time Pod - Control your own robot to travel through time and cooperate with others to complete challenges. Cool down - In this section children can recap on what they've just experienced and learn in more details about the history. I'm very proud of this project where the design stays true from the concept to its fruition and it received national and global awards. Kspace won the MAGNA Interpretation, Learning and Audience Engagement Award at the Museums Australasiaconference in Auckland on 18 May 2016. The MAGNAs recognise excellent work nationally in the categories of exhibition, public programs and sustainability projects. It also won a silver MUSE Award in the Multimedia Installations category at the 2016 American Alliance of Museums Annual Meeting in Washington, DC on 26 May 2016. The MUSE awards recognise outstanding achievement in media and technology programs by galleries, libraries, archives and museums around the world. 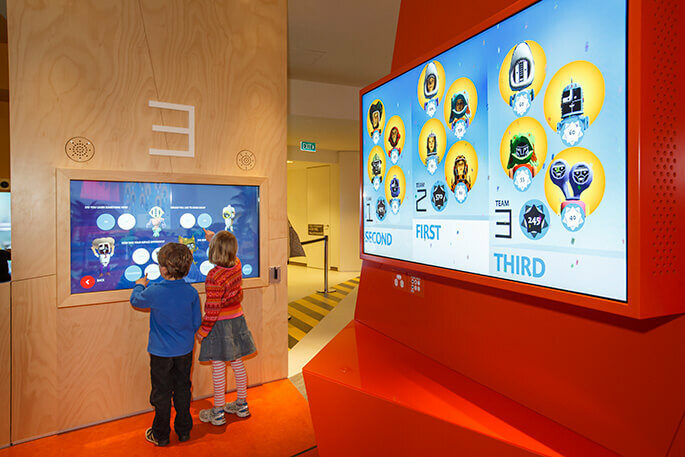 In the design station children can personalise their own robot by mix matching robot limbs, colouring them anyway they'd like and the interactive station will take their photo to be placed as the robot's face. The first one is a mini game where each child needs to control their own robot to play simple mini games like collecting wood or coins. 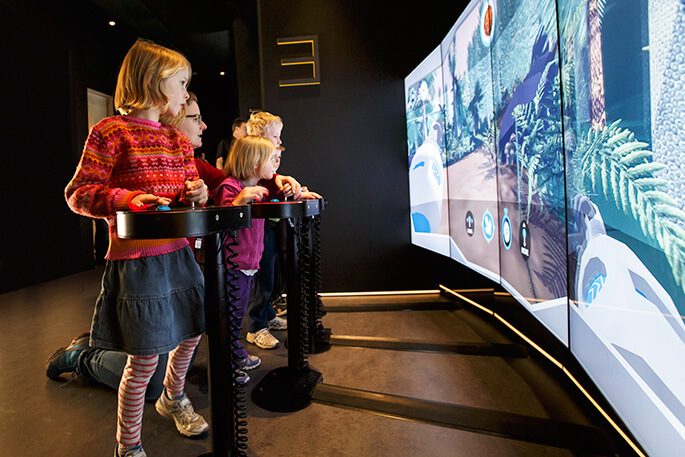 The second is where up to 4 children need to cooperate to control one larger robot together to navigate their way across Australian landscape. There are four different controls, head to look around, legs to move around and both individual arms to interact with the surrounding. There are different locations and times in the Australian history that they can visit to encourage repeat visits. 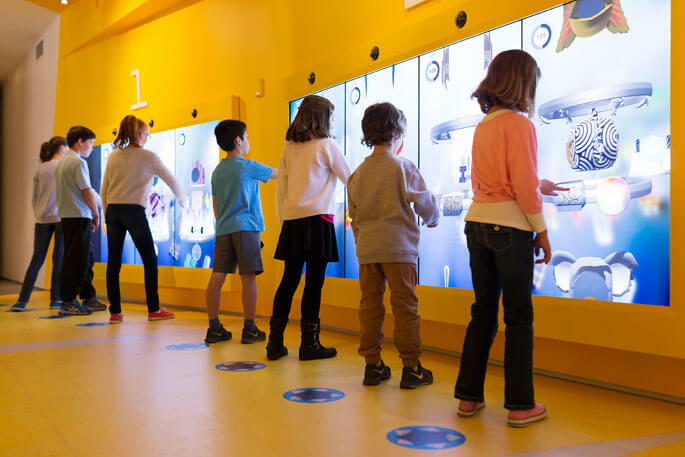 In this area children can learn about the place and time they've experienced in details. All the characters they've encountred, the time, the place and the objects they've interacted with. There are a lot of elements in this projects from overall experience concept, spatial design, game design, character design and story telling. Each of them takes a massive amount of effort and an awesome team to deliver. These are few of them in details. 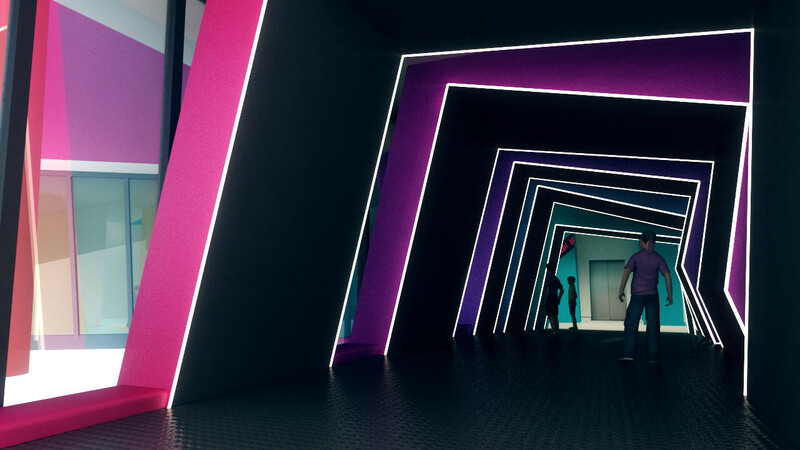 Time travel was the concept for the space. These are few early concept renderings showing angular design and using forced perspective to create a transformative space. The experience should be self explanatory and since there's a minimum need of hosts in the space, we need to create a persona in the space that helps children to understand the taks at hand. This is where KC comes to live as a pretend Artificial Intelligence guide that controls the space and the experience. KC is designed to be a young adventurer or a mentor for the players, not a mother to them. She's quirky and has a bit of an attitude like a teenager. She guides the players from start to end and takes many forms, from a soundwave to a talking orb in the interactive experience. Most of the robots are designed to have an Australiana look. Some of the drawings were done by the team's children and realised as 3D models. The robot limbs can be mixed and coloured, making it highly personalisable for the users (children). Each robot has an LED screen face for the children to display their selfie. It's the embodiment or representation of the children's virtual identity to travel in space and time. The players time travel to a specific event in Australian history. This means there are a lot of historical facts to be told in a such a short period of time. 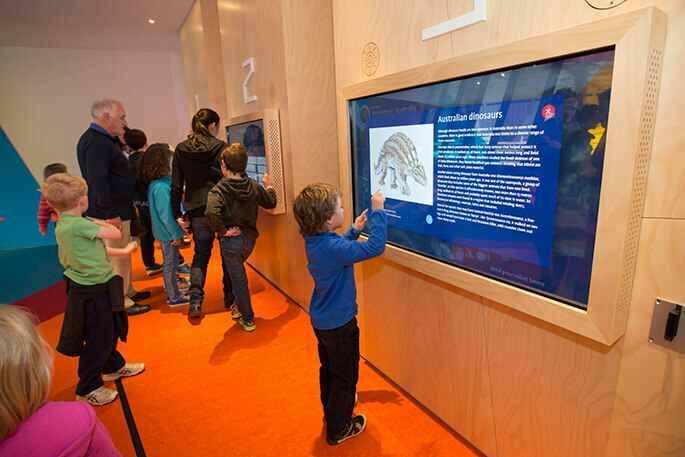 Working together with NMA's curator, we pin pointed and created the experience around major historical events. Some of the events are like Gold Rush era, Captain Cook and Franklin Dam. We can't replicate the look and feel of the era exactly within a gamified experience. It will take years to accomplish so many events. So our approach was to stylistically design the characters, objects and environments to represent the historical truth. This geometric and low poly design took cues from the spatial design. They are consistent and work in harmony to create a seamless experience with detailed historical accuracy. 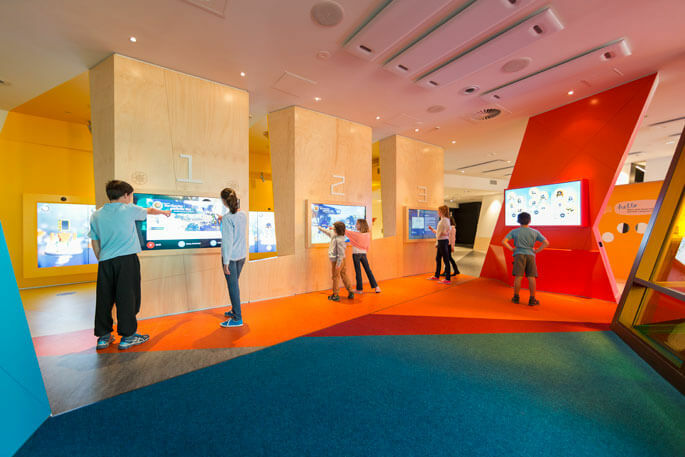 I'm really proud of what we've created that is really enjoyed by children from all around Australia and learning about their history in an immersive experience.